PROFILE - I am a professional artist married to a retired bishop and we live near Ross-on-Wye, in the Border Country of the Welsh Marches. I teach weekly adult art classes in Hereford. I think of myself as a storyteller, whether I’m working on landscapes, portraits, figurative work, pottery or writing. 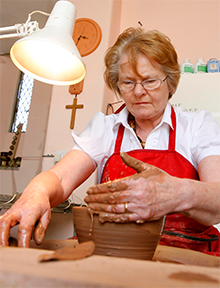 "Working potter" is how I describe myself, not as a ceramicist! My workshop is a purpose-built shed in our garden, where I work with a dual-purpose clay and fire to earthenware and stoneware temperatures. It’s important to me that my work harmonises with the story of the countryside, so my clay bodies are a combination of Staffordshire and Shropshire clays, and for my glazes I source local clays. I make functional and decorative ware decorated with wax resist, leaf resist, sprigs, oxides and sgraffito. My pots tell the story of the land and are designed to be used. Recently I’ve explored animal sculpture. Portraits are mostly commissioned oil paintings, though for self-discipline I work in coloured pencil on dark brown paper, pastel or in watercolour. During a commission, a person would ‘sit’ for approximately five 1½ hour sittings, but it takes me about 100 hours work to complete it in my studio! It’s a reciprocal, collaborative process where I try to portray both story and personality. Landscape painting in our local area is inspirational, rich in subject matter: hills, valleys, rivers and buildings. I favour earth colours in conjunction with a bright palette, and try to convey the ‘story of place’, the variable light of each context, and the mood of the weather. The Necklace – a novel influenced by the larger Jewish story of the Holocaust, but the underlying themes are universal, concerning people whose lives are in flux, whose memories are flawed and who are seeking self-determination in a new context. It is set in 1930’s East Germany, Israel and England and is written from the point of view of the daughter of a Holocaust Survivor, a single parent portrait painter. The necklace portrayed on the cover of the book is her mother’s legacy, dating from the last Tsar of Russia, where the family originated and a tangible connection with her mother’s story. Night Fires - a novel. Set in Nigeria this is an epic drama of cross-cultural tensions, religious conflict, jealousy and deceit, where the protagonists, though flawed and uncompromising, are reconciled through shared suffering and self-sacrifice.